SagreraBrazil Design knows how to make a statement. The San Francisco design firm has worked on projects throughout the Bay Area that are focused on creating luxurious environments that are comfortable enough that clients can unwind and recharge. In this San Francisco loft, they have done just that. Designing a home that is equal parts style and comfort. Elements have been brought into every room to create relaxing moments. In the bedroom, an extensive upholstered headboard sets the stage for resting and relaxing in style. The home was designed with city living in mind. It's a "concrete slab building and the ceilings were exposed concrete so we painted them in a high-gloss finish without correcting the irregularities in the concrete which results in a rippled water finish," remarks the design team. "That reflects what is happening on the street, especially at night with the play of lights of cars driving by." In addition to special finishes that reflect city life, the designer's also focused on practical elements in the space, like storage. In the bedroom, a walnut armoire becomes the perfect place to hide away electronics, like a large-screen television. Since the building is a high-rise, the designers focused on bringing in elements that help to create a warm environment. Woven wallpaper immediately makes the bedroom feel cozy. "Our goal was to create an oasis of calm, a place to come in from the energy of the city." And each room in this space does just that. The bathroom feels like a calming oasis, with ambient lighting and a raised sink that would be found in one of the city's most luxurious spas. The open plan living room, dining area, and kitchen reflects the layout of many Bay Area homes. The challenge is always, how to demarcate and create living areas in an open-plan space. The design team focused on unique architectural elements to define the space. "We took advantage of the large wall that wraps from the living area into the bedroom and created an architectural moment by covering it with a woven hemp wall covering." The textured wall creates a beautiful statement area in the home's living area. 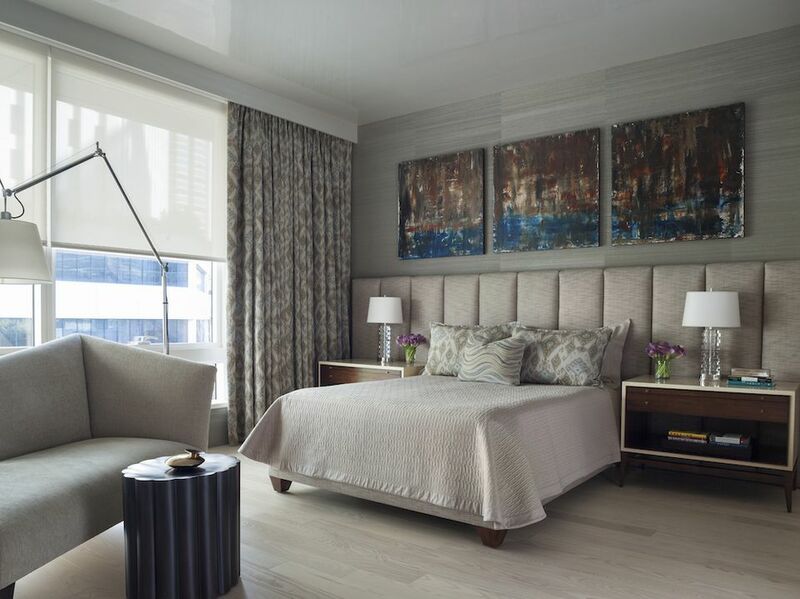 "We always want to layer textures and colors, especially in a high rise condominium, because it adds warmth even when minimally furnished." And it truly does add warmth here. The tactile layer of elements in the living room is striking. A wood panel, that looks like a work of art, is actually a hiding place for the living room television. Surrounded by a mix of paintings and photographs, the living room wall offers a beautifully rich vignette. The open plan extends into the home office where a stylish seating nook has been carved out for visitors. In the home office, the team focused on mirroring the building's original architecture. "There are a few structural columns in the unit that stand along one of the window walls. We continued this rhythm by incorporating the shape of a column into the base of the desk." For contrast, the office wall was painted a deep putty shade, and a gallery wall installed, bringing a pop of color into the space. The dining room is a seamless reflection of the home's outdoor space, where planted gardens can be seen outside the window. The home is "located on the third floor so it does have a relationship to what’s happening on the street." The colors of the plants in the neighboring buildings are reflected in the seating around the dining table, from a beautiful green settee to colorfully striped dining chairs. To complete the home's look, the designers were able to utilize some of the client's existing furnishings in the space. "We refinished, reupholstered, and repurposed for their new space." In the end, the result of this San Francisco home was picture perfect. "This ended up being a turn key project so the client knocked on the door and everything was in place, the refrigerator stocked, the champagne chilling, their clothes put away, music playing. We handed them the keys and then left them alone to enjoy their new home."